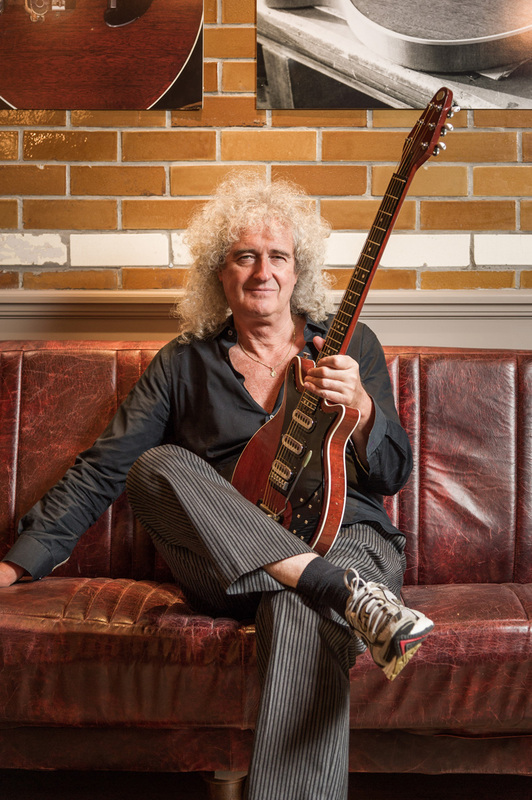 As part of an interview with Brian May that was published in the UK by The Guitar Magazine on 1st December 2017, one that first announced to the world that the Red Special’s original pickups had been found, we asked him to talk – in hitherto unrivalled depth – about the pickups, their design and what ultimately led them to be replaced by the now iconic trio of Burns Tri-Sonic single coils. Part of the following interview forms sections of the feature published in TGM and we’re grateful to them for allowing us to publish this content in full. Brian May: Yeah, I was worried that we couldn’t find them: it was one of those things that eats away at you in odd moments. But it’s great that Pete found them and here they are, which makes me very happy. Looking at them, it reminds me of a lot of stuff. They were, of course, original features of the guitar and they did work really well. BM: I figured out that the principle behind a pickup must be that you have a coil or wire around some magnets that create a magnetic field and when the string vibrates within that magnetic field it causes a change in the flux that links the coil, as a physicist would describe it. When you change the flux you get an EMF generated in the coil, which effectively makes a current, and that’s what you amplify to make the guitar electrified. I was clear about the principle so I bought some little Eclipse button magnets from a place in Kingston (upon-Thames), screwed them to a block and put a former around them and I wound, I think, 50 gauge copper wire around them. Me and my dad made a little winder to do that, and you have to be incredibly careful with 50 gauge wire; it’s like a human hair and you can’t stress it or else your whole coil is ruined. So we wound as many turns as we could get around these pickups. Then there’s a piece of plasticard around the outside and it’s all buttoned up really neatly. BM: Now, that’s another invention that I never pursued. Most pickups that you buy have a couple of wires hanging out of it and you have to solder those wires onto some part of the guitar. 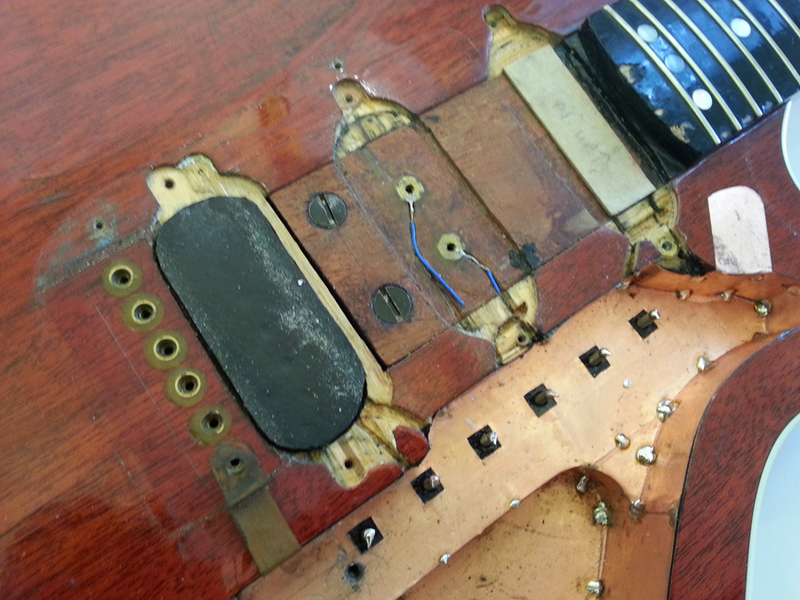 So, my little invention was that, instead of doing that, the wires are terminated not only on little brass tabs that are built into the pickup itself, but they’re also built in around the two screws that fix it to the body. 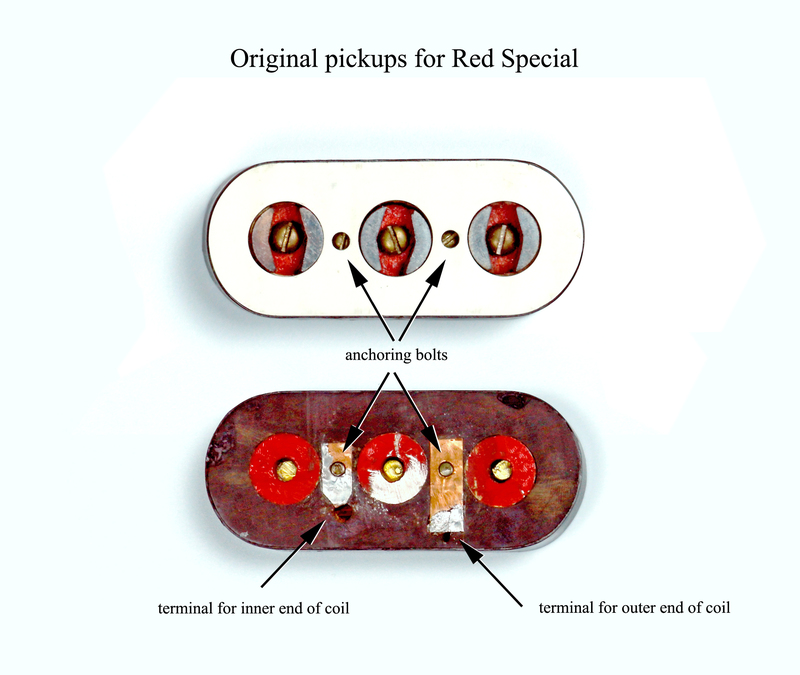 So, when you put these pickups on the guitar you don’t have to do any wiring; they’re automatically wired into the system. 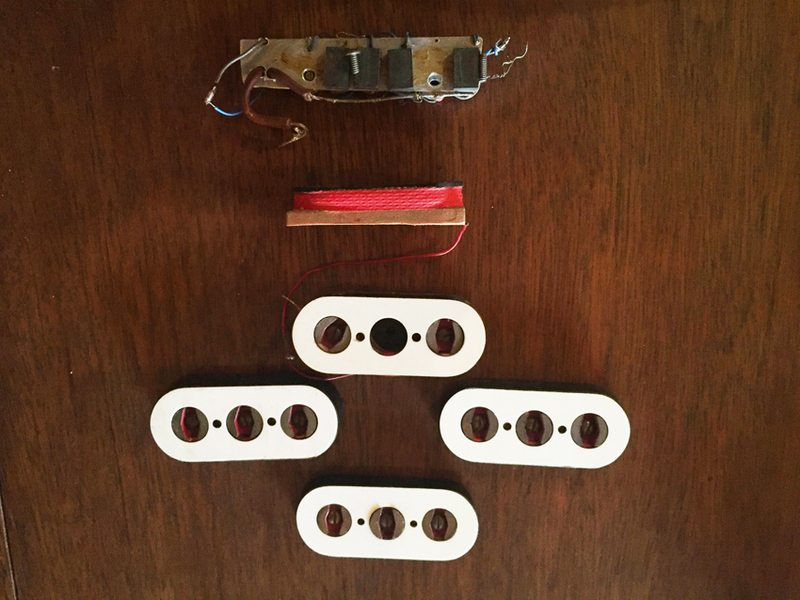 It’s quite a neat way of doing things as it means you can interchange pickups really quickly and easily without doing any wiring changes. I was quite proud of that! SB: Could you describe the sound problems you experienced when using them? BM: I remember they had an amazing top end to them, but there was one flaw, yes. I wanted to bend strings and when you bend strings with this pickup in place, it picked up the sound OK but added in was this strange sort of shuffling noise a bit like the sound of striking a match on the side of a matchbox. That obviously got in the way and it wasn’t practical to use them. Now, my theory at the time was that instead of having all north poles at the top of the pickup I had alternately north/south, north/south, north/south and what I wanted to do was cut those magnets in half so I could put all norths on one pickup and all souths on another. Unfortunately I never had the opportunity to do that as I didn’t have the equipment. It’s incredibly hard what they make the magnets out of, some kind of special steel I think, and I didn’t have anything that could touch them: it’d take all the teeth off a hack saw. BM: Well, it has to be three apertures because only three magnets can go in there. They’re button shaped, with both a north and south sticking up, so it had to be three apertures rather than six. I thought that, as the polepieces are equally spaced, it would make a nice, even magnetic field but actually it doesn’t because I think what happens is the north pole, which is next to the south pole of the next one in line, draws the field in very close, which it shouldn’t: the field should really be going outwards to meet the strings. So something happens when the string hits that intense field, but I’m not sure. 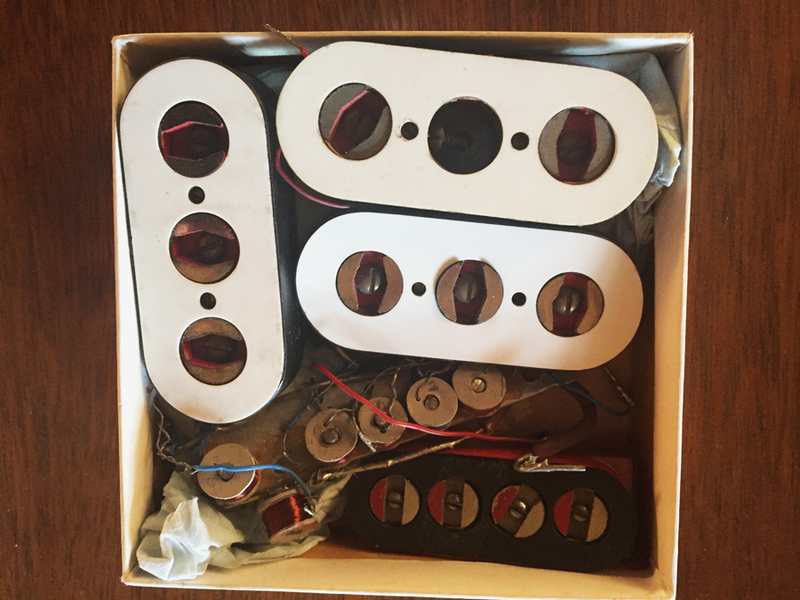 BM: So, looking at them now, I’m thinking that it’d be nice to revisit and do that, cut them in half, put them back in so that all the norths are in a line and see what kind of noise the pickups make. BM: I just had this white Formica and I liked the look of it. I thought they looked quite attractive at the beginning and I think the idea that you weren’t hiding the pickups, that you were making them a highlight, appealed to me. Strangely enough I didn’t really like the way they looked afterwards and I remember that when I got the photos back from Putney I sort of painted the whiteness out, thinking that they looked not very cool! SB: That’s great news! 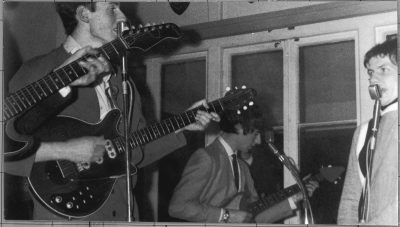 How did you go about amplifying and recording the guitar back then? BM: In those days I used a preamp that I would plug this straight into the amplifier which served our Collaro two-track, but reversible, tape recorder. The recorder had three speed settings, 15, 7½ and 3¾ inches per second, and what happened was that if you slowed the speed down you’d lose all your top end. This happens because it becomes very inefficient so when I switched from 15 to 3¾ you’d have to compensate. The preamp had three different positions for the three speeds and if you run at 3¾ there’s a massive amount of top end being added on: it’s like a really violent EQ and that’s what I liked. 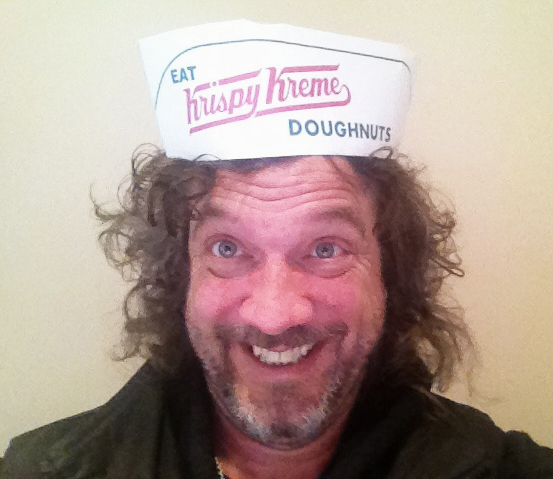 That’s the precursor to the treble booster that I’ve used ever since I met Rory Gallagher. 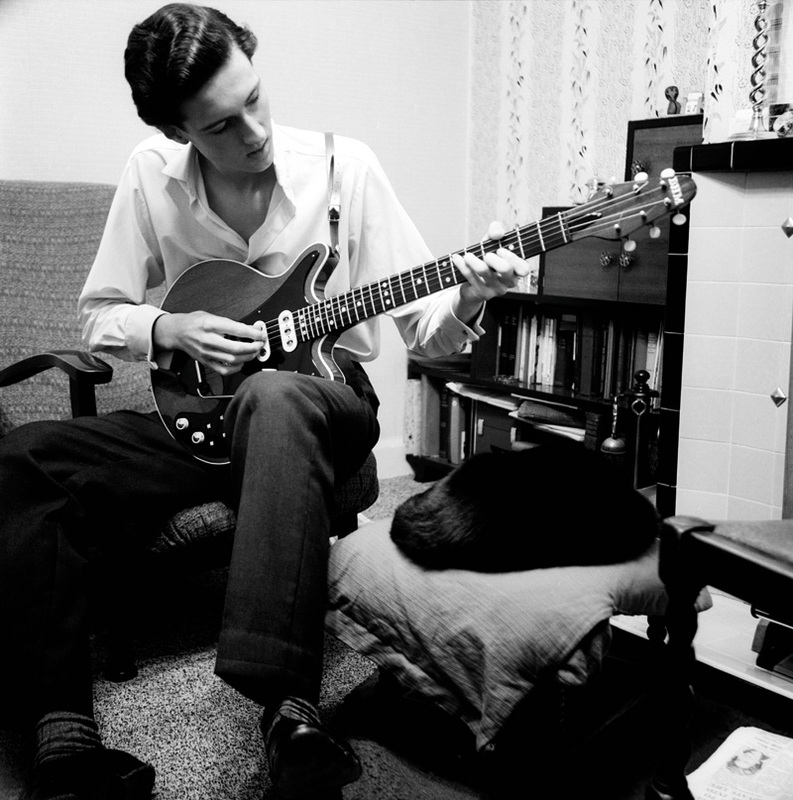 BM: So, I’d plug the guitar into that preamp, put in on 3¾ so it’d give me the top boost, come out of that and straight into my dad’s homemade amplifier that served our record player, tape recorder, radio and everything else. So that was my little system and I remember cranking it up and my mum getting very anxious about the neighbours, but it had a real sizzle to it and that was the sound I wanted to get onstage. Again, what stopped that happening was that bending the strings didn’t work, but it had a great low end and, because of this EQ, a great top end as well. SB: And what speakers would you have been using? BM: I think it was just a Wharfdale speaker in a cabinet that my dad had made. SB: Maybe you could fit the pickups onto a guitar? Maybe a Guyton or BMG Super? BM: They had a particular sound to them and I am now wondering if we should go back and look at what they brought to the guitar. 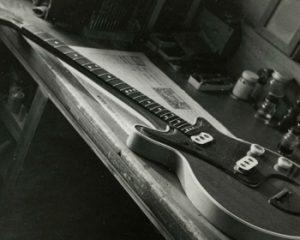 Strangely enough they would still fit onto the original guitar because the tabs that would mate with the tabs on the pickups are still there, so it could be done.